It’s been hot and will be getting hotter: in the 90s now and 106 expected in a couple of days. I really hate this kind of heat, and it drains all the energy out of me. I don’t even feel like reading. Nevertheless I did finish a few things. The Galton Case by Ross Macdonald was, as you would expect, excellent. Though it’s not forgotten in any sense of the word, it’s worthy of a Friday post, which will be upcoming. Then I wanted something different from hard-boiled, so, having read a review of one of M. C. Beation’s Hamish Macbeth novels, I decided to try one. I wanted to start with the first book, but it wasn’t available from the library, so I got Death of An Outsider , the third in the series. Macbeth is a Scottish Constable, happy in his small village of Lochdubh, leading a simple life living among people he knows and for the most part likes. However, he is sent to a neighboring village of Cnothan to cover for the Constable there, who is going on vacation for 2 weeks. 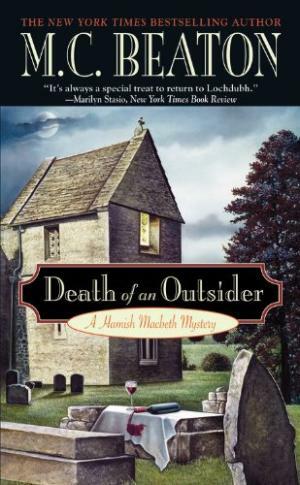 Naturally, a murder occurs, and Macbeth is thrown into the middle of the investigation. I liked it a lot, then got the first in the series, Death of An Outsider, then the fourth in the series, Death of A Perfect Wife. I’m waiting for the second in the series to arrive from the library. Barbara finished Chaos by Patricia Cornwell. She liked it well enough, but said it wasn’t one of the better ones. 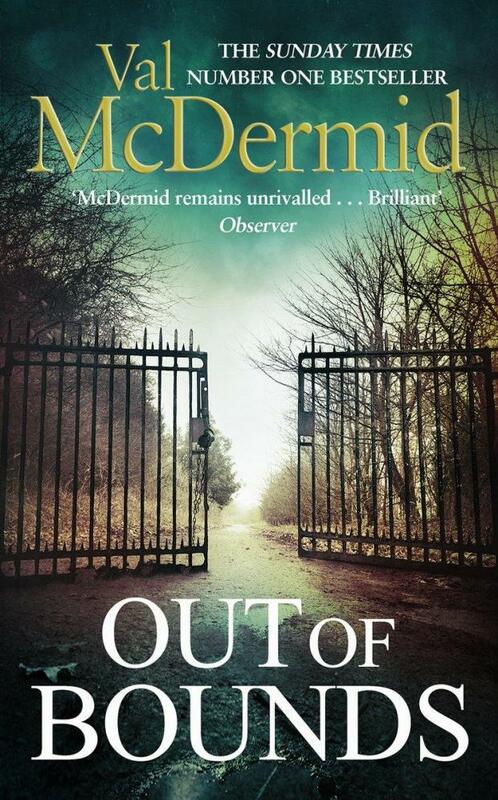 She also finished Val McDermid’s Out of Bounds. It’s the lasted in the Karen Pirie series. She always enjoys McDermid, though this time she said there was more Scottish “lingo” than she prefers. She’s now waiting for A Game of Ghosts, the new Charlie Parker Thriller by John Connolly to show up from the library. This entry was posted in current reading, Mystery. Bookmark the permalink. Didn’t read much this week. Read the new Ace Atkins The Fallen and Where Dead Men Meet by Mark Mills. Liked both. The Mills is a thriller in the Eric Ambler, Graham Greene mode . Read a few short stories and that is it. Glad you liked the Ross Macdonald. I have read them all at least twice. Gave up on Cornwall years ago. Liked her first couple but began dislikng her characters. Have liked the Val McDermind that I have read. I finished the Joseph Heywood collection, HARDER GROUND: More Woods Cop stories, about “Conservation Officers” i.e. game wardens in Northern Michigan. I liked it a lot. All or most of the protagonists this time are women. Also read FORESKIN’S LAMENT: A memoir by Shalom Auslander. Very good book about growing up in – and rebelling from – an Orthodox Jewish community in Monsey, NY. I ordered his short story collection, since my library doesn’t have it. Also bought a number of Kindle books – some free, some not. I’m hoping to finish the latest Kate Burkholder book by Linda Castillo, DOWN A DARK ROAD, today. The title of the Auslamder book seems inappropriate, but I guess that’s just me. When I get off the M.C. Beaton ride, I’ll start the second in the Linesman series, but still plan to read the Heywood soonish. I finished A Shock to the System by Simon Brett and soon we will watch the movie … the first time since it came out … I think. I read The Fashion in Shrouds by Margery Allingham. A reread. I enjoyed it a lot, although it is not a perfect book. Right now I am reading another book from Ann Cleeves Shetland series, Blue Lightning. The book Steve read by Mark Mills sounds very good. I need to read more of his books. I’ve read just one Cleeves, and it was a cozy about birdwatchers, as I recall. The birdwatching series was her first. I have read one or more books from all her books, except the birdwatching series. The book I am reading now, Blue Lightning, features birdwatchers on Fair Isle in the Shetland Islands. All of her series, I meant. Just picked up the blu ray of Shock to the System. Not a very good transfer tho. Yes, that is what we have also. That is a shame about the transfer. It’s been warm here, too, Richard, so most of the week has been spent indoors glued to the idiot box. We got rid of regular cable television this week and now have only streaming services — Netflix, Hulu, HBO NOW — and it’s working well for us. The movie selection is fairly poor but there’s a lot of good television series available. It’s been another reading week: one Reacher by Lee Child (THE HARD WAY), Ralph Milne Farley’s THE RADIO MAN (my FFB this week), and Dean Koontz’s latest (THE SILENT CORNER). I really liked the Koontz despite his obvious faults; I swear the could cut the book by 70% and still have the same story. The Koontz is the first in a trilogy, with number 2 coming later this year. I’m finally getting to Stephen King’s THE PLANT and I have Bill Pronzini’s latest (and reportedly last) Nameless mystery in the chute. After that, I’ll probably tackle King’s IT (all 1153 pages!) in preparation for the upcoming film release. Glad to see you’re having a good time with the Hamish MacBeth books; I like them a lot. Barbara seems to like many of the same books I do, but I gave up on Cornwell a long time ago. I am looking forward to getting my grubby little hands on John Connolly’s latest. I hope your garden survives the heat. Stay cool, my friend. The Cornwell was a freebie from her publicist. How do you get local news and weather, sports and things like PBS? I was just out watering in 93 (and rising) trying to hydrate the things that are wilting We’ll see. I’m reading #6 of Macbeth and just got #2 from the library and then I’ll take a break from them. I have many other things I want to get to. King and Koontz like their books to be big and fat and their editors let them do it. When they’re so successful and money-making, why not? I sure wish I could have some ice cream! (but it’s not allowed). Just FYI – there is a movie about Beaton’s second series character, Agatha Raisin, on PBS here next week. I don’t think that series is for me, but thanks. I’ve now read the first 8 Macbeth books, and that’s enough. I was going to do one for FFB tomorrow, but am under the weather. Maybe next week.